The Madison Blue Streaks girls’ tennis team picked up a win over the Harvey Red Raiders. Madison defeated Harvey in all five matches to win 5-0. It wasn’t all easy for the Blue Streaks as Megan Preston, of Harvey, made the second singles match close. The first doubles team of Katelyn Bartol and Lauren Grundy also forced a third set. In first singles Elizabeth Bottar, of Madison, defeated Morghann Musselman, of Harvey, 6-0, 2-0. In second singles Payton Lewanski, of Madison, defeated Megan Preston, of Harvey, in a close match 7-5, 7-5. Madison also won the third singles match due to a forfeit. Izzy Gnagy accepted the forfeit for the Blue Streaks. Olivia Durst and Gabby Jayne, of Madison, paired up to defeat Lauren Grundy and Katelyn Bartol, of Harvey, in first doubles by the score of 7-5, 3-6, 6-4. Alexis Nicoson and Mimi Gasi, of Madison, teamed up to win their second doubles match over Pamela Huler and Lilly Bermudez, of Harvey, 6-0, 6-4. 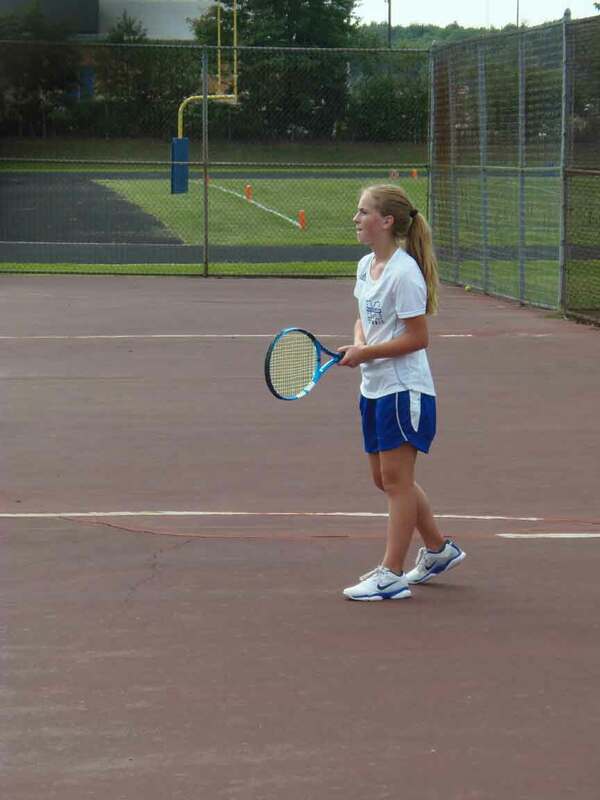 Pictured: Elizabeth Bottar, of Madison, plays in a recent first singles tennis match.